The fiberglass and steel entry doors we offer are engineered with both beauty and durability in mind, so you can rest assured your new door will add to the curb appeal of your home while standing tough against inclement weather and unwelcomed visitors. 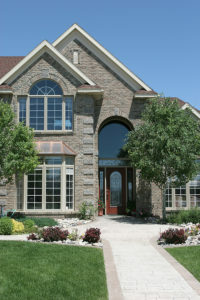 In fact, all of our entry doors feature an 18-gauge steel frame, deadbolt security plates, and laminated safety glass. And, thanks to being incredibly energy efficient, your new door will help keep your home warmer in the winter and cooler in the summer. Additionally, these doors can be customized to meet your aesthetic preferences, as you can choose the decorative glass, hardware, and other features you’d like incorporated into the design. When you think of storm doors, you might think of unattractive doors that hinder your outside views. When you turn to AAA Window – Siding Roofing, we think we’ll be able to change your mind about that. The incredibly tough and secure storm doors we offer are customizable, so you can choose the frame, size, and color to ensure the door complements the style of your home. Additionally, these doors are designed to maximize views of the outdoors. We offer beautiful French and sliding doors that are as long lasting as they are gorgeous. Our French patio doors feature a uniquely designed seal component that prevents undue wear and tear, and these products can be customized to meet your aesthetic preferences. The sliding doors we offer are available in three vinyl colors and three woodgrain interiors. Additionally, they come with heavy-duty extruded screens that are easy to operate. Furthermore, they feature panels that perfectly interlock, making it virtually impossible to remove from the outside, enhancing your home’s security. They can also be upgraded with internal mini blinds for increased privacy. No matter which patio door you choose, you can feel confident that you are investing in a product that is visually appealing, secure, and highly energy efficient. When you partner with AAA Window – Siding Roofing, you can rest easy knowing our highly experienced and factory-trained installers will correctly and promptly install your new home upgrade for you. We are so confident in the work we complete, we offer a lifetime service warranty. For more information about the premium doors we offer to homeowners in Lincoln and other cities throughout Central Illinois, contact AAA Window – Siding Roofing today. We’ll be delighted to answer any questions you have and schedule you for a complimentary consultation.